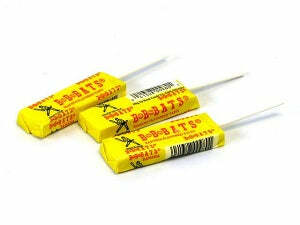 To every generation there is born that one person who loves banana flavored candy. It’s an acquired taste, in a similar vein to the select few black licorice lovers. But never fear! 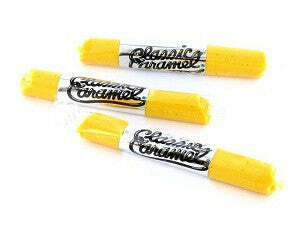 Banana fans won’t be left out here at Old Time Candy. In this post, we do a roundup of the best candy banana has to offer. The Banana Split is a big ol’ cube of chewy banana goodness. 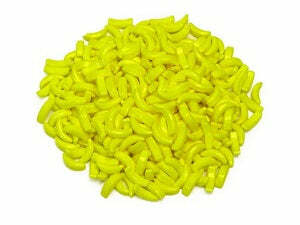 Soft and succulent, this candy promises all the taste of a banana split in a convenient little chew. This one’s for the soft candy lover! We all have that friend who always asks for the banana out of our box of Runts. Now they can have a supply all to themselves! 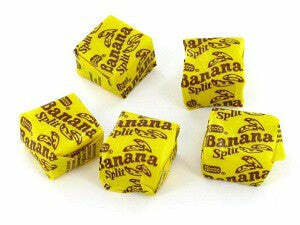 Miracle of miracles, we at Old Time Candy stock a container solely occupied by Banana Runts. Take a swing at these BB Bats! Invented in the 20s, these taffy suckers come in a multitude of flavors, but the most important variation is banana. For a long lasting flavor sensation, try this pop! Love the chew, but not the cube? Bite off chunks at your own discretion with these banana-flavored Flipsticks! This soft, gooey caramel is the perfect size to stick in a shirt pocket to keep for later. 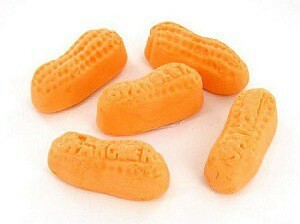 And last, but not least…the good old Circus Peanut! Definitely the strangest flavor choice for these peanut shaped snacks, but something about the banana-inspired circus peanut keeps people coming back! A sure to please gift for any banana lover. Want your favorite flavor in the spotlight? Write to us in the comments below!